Spring Open House = Fresh Inspiration + Fabulous Discounts! WARNING What you are about to read may make your heart skip a beat, cause shortness of breath or turn your eyes green with envy. Proceed at your own risk. Last Friday my husband asked, "What are we doing tonight?" I checked my calendar and was surprised to see that for the first time in several days (maybe weeks?) we had nothing scheduled. As my mind began planning, "...dinner, maybe catch a movie...oh, wait there's a soccer match tonight...maybe order take-out and watch the game..." my husband interrupted my thoughts with the most magical suggestion to ever grace his lips. "How 'bout if I help you clean your sewing room tonight?" Hold it right there, ladies! He's taken! I ran to him, threw myself into his arms and said, "Yes, a thousand times, yes!" True story! Indeed, my sewing room is now cleaner. I got one of the good guys. He cooks, he cleans, he appreciates when my quilt block points come out perfectly... he's a keeper. And this weekend he's out backpacking with the guys which means I just may spend some alone time in my newly straightened sewing room. I better, because I have quite a to-do list in preparation of our SPRING OPEN HOUSE! Please join us Thursday May 10th - Saturday May 12th as we kick-off another season of fabulous classes, events and block-of-the-month clubs! Stop in to pick up a copy of our new class schedule featuring events running May - August. See new shop samples, sign-up to learn something new and enjoy discounts such as 10% off regular class fees, 20% off class supplies and 25% off one regular price item of your choice! May 10th at 10:00 am registration will open for all new classes including the much anticipated Saturday Sampler! You will be able to sign up in-store, online or by phone. Discounts may not be applied to retreats, clubs, or block-of-the-month programs. Some classes may not be available for online registration. 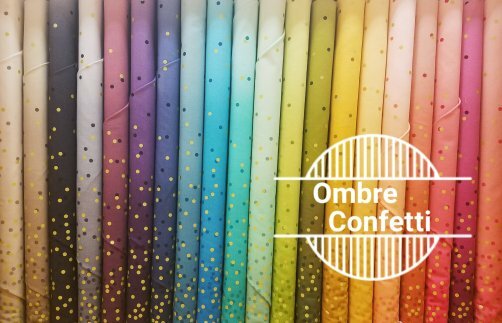 The Ombre Confetti Metallics Collection by V and Co. has arrived and it is DAZZLING! We had so much fun at last week's Handwork Club learning an applique technique from Yvonne Van Rijn! We are excited to offer more opportunities to try new techniques as we learn from another experienced applique artist, Karin Crawford! We find with applique, it's best to try several different methods, then choose the one that feels best to you. Our handwork club meets each Tuesday, 10 - noon. Bring any handwork project you may be working on and stitch the morning away with friends who love applique as much as you do! Applique Thread: Superior Kimono Silk 100 wt silk; Superior Bottom Line 60 wt polyester; Wonder fil Efina 60 wt cotton. 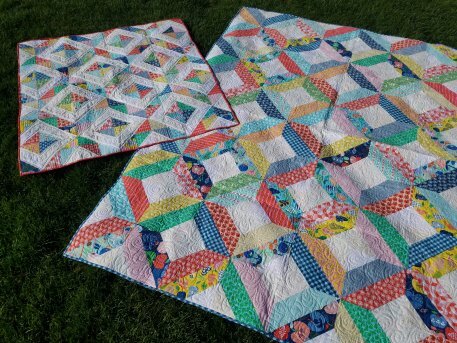 The name of Emily Herrick's fresh, new pattern, Slice'n'Dice was inspired by the fun, fruity fabrics she chose to slice up, sew, then dice into blocks. Finishing the larger quilt (72" x 90") leaves behind half square triangles perfect for making the smaller quilt (36" x 39"). 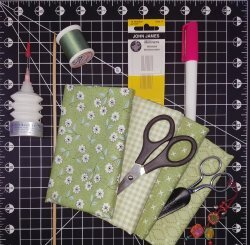 The pattern includes instructions for both and we have kits! May 7th - 25% off FLANNEL including all regular price yardage and hemstitching kits! May 18th at 11:00 a.m. here at the shop! The UFO number for May is 10.